Private Robert E. VanderHaar, 1517 W. First Street, has arrived at Albright College, Reading, Pa., for instruction prior to appointment as an aviation cadet. Source: The Sioux City Journal, unknown publ date sometime after August 1943. Robert E. Vander Haar, son of Mrs. Lillian Irene Vander Haar, 1517 W. First street, has been graduated from Ellington field, Tex., as a navigator and received his commission as a second lieutenant. 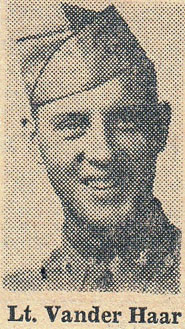 Before entering the armed forces he was employed with the civil service in Sioux City. Second Lt. Robert E. Vander Haar, son of Mrs. W. H. Vander Haar, 1517 W. First street, is now stationed at MacDill field, Tampa, Fla., where he is undergoing combat crew training as a specialist on a B-29 Superfortress.